Join former All-Star Catcher and Puerto Rico Native Iván Rodríguez at the Econo Iván Rodríguez Baseball ProCamp in partnership with P&G. The date is February 7, 2015 and the location is at the Raiders Baseball Academy, Calle Barcelona, Bayamon, PR. Time: 9:30 AM to 12:30 PM for boys and girls grades 1 – 12. Cost: $0. Source: Procamps.com. 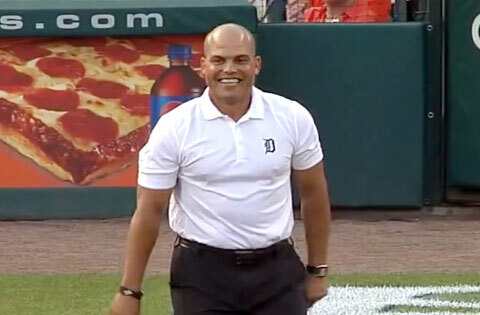 Photo shows former Tigers’ and All-Star catcher Ivan Rodriguez where he threw out the first pitch from home plate to second base at Comerica Park in downtown Detroit on August 2, 2014. Throughout the camp Iván Rodríguez will offer tips and instruction, highlighting the finer points of baseball. Participants will experience various stations specializing in fundamental baseball skills and will participate in baseball games. Participants will be placed in small groups according to age to ensure that each child gets maximum instruction. Watch Ivan Rodriguez speaking about how his performance in a 2008 interview. Iván Rodríguez, nicknamed “Pudge,” is a retired Major League Baseball catcher. During his career, he played for the Texas Rangers, Florida Marlins, Detroit Tigers, New York Yankees, Houston Astros and Washington Nationals. Rodríguez won the World Series with the Marlins in 2003, and also played in the 2006 World Series while with the Tigers. On June 17, 2009, He announced his retirement on April 18, 2012. He signed a one day contract with the Rangers on April 23, 2012 retiring as a member of the team. Rodriguez also threw out the ceremonial first pitch during the Rangers home game against the New York Yankees. Instead of throwing out the ceremonial first pitch from the mound, he went to his usual position behind the plate and threw a strike to Michael Young at second base. Playing Field Promotions is a booking agent for motivational sports speakers and celebrities. If you would like to book Iván Rodríguez for a speaking engagement or personal appearance, contact Iván Rodríguez’s booking agent for appearance & speaker fees at 1.800.966.1380.